Many people would argue that cycling and mainstream fashion haven't been comfortable bedfellows over the years, but the lines between the two are becoming increasingly blurred. As cycling becomes more a part of people's everyday lives, the clothing we wear to cycle in is changing too. London-based Huez* has demonstrated this perfectly by creating a range of stylish, high quality clothing with a host of cycling features, and the Pro Pique Polo is no exception. It's a fairly classic looking two-button polo shirt that falls very much into the smart-casual clothing category. It looks good dressed down with a pair of jeans or shorts with trainers, but can scrub up smarter with a decent pair of trousers and shoes. What sets it apart from your average high street polo are some underlying features that allow it to work on the bike as well as off. 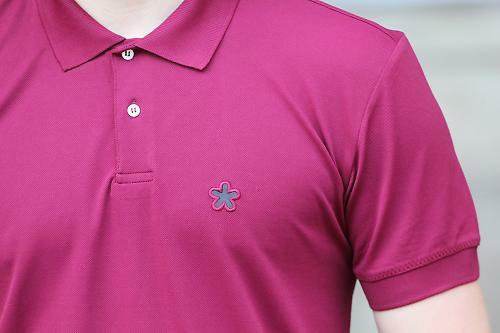 The Pro Pique Polo is made from a polyamide nylon. It's soft and comfortable to wear and is also highly wicking to take moisture away from the skin, which is great for riding on warmer summer days. The cut is slim and fitted, with the back cut slightly lower for when you're on the bike. Despite this, it's still a little on the short side generally, so even with the dropped back it can leave the bottom of your back slightly exposed. The material on the collar and the cuffs is slightly ribbed, and there are two contrasting white buttons on the collar. The front chest features the Huez* asterisk logo picked out in Darklight material; this looks black in daylight but shine a light at it in low light conditions and it's highly reflective. 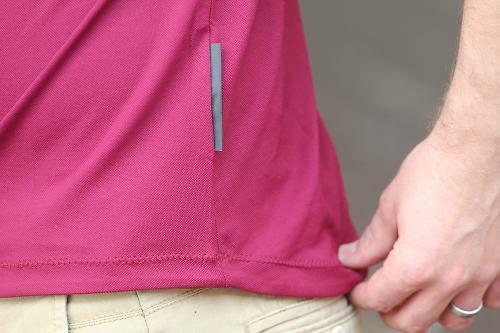 There are also two Darklight tabs stitched into the bottom of the seams on either side of the polo. The Pro Pique Polo is really comfortable to ride in. The fast wicking material works well and it dries out pretty quickly if you do get a bit sweaty or you're caught in a rain shower. The body could be an inch or two longer to provide a bit of extra cover when you're on the bike, but this might compromise the look off the bike. When you're not riding, the polo looks good. The performance characteristics of the material are obviously invisible to the human eye, the dropped back isn't too noticeable, and the Darklight material is pretty inconspicuous. There's nothing about the polo that explicitly says 'cycling'. The Pro Pique comes in either purple or damson, and is available in sizes XS to XXL. It's available through the Huez* online store for £60, a considerable price but not overly extravagant for a well made polo shirt with some nice technical features (a quick online search reveals a Ralph Lauren polo at £70, Hugo Boss £65...). The length could be a sticking point, but it's obviously not going to be a problem for all, and sizing up could be an option. 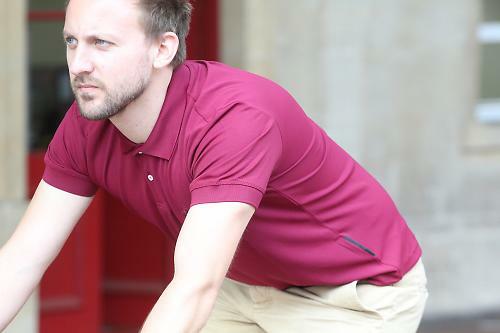 A polo shirt designed to be used on and off the bike, a smart/casual top with some cycling features. Huez* says: "A daily use classic polo with cycling features." Huez* says: "Made from 100% polyamide the material is soft and highly wicking. The back has been extended to improve comfort when riding. "Our Huez* star logo at the chest and Darklight reflective tape at the side seem improve visibility when the dark sets in. Made from 100% polyamide the material is soft and highly wicking. "Perfect for those warmer days. "High Visibility Huez* Darklight tape provides maximum reflectivity with a more sartorial feel." A nicely made polo, simple but solid. Really comfortable to wear with good wicking properties. Comfortable on and off the bike, but could do with another inch or so of length when on the bike. It worked really well; it left the base of my back exposed on occasions but it wasn't too much of an issue in warmer weather. The subtle cycling features integrated into a classic polo shirt styling. The slightly too short length. This is a really nicely designed and made polo shirt with subtle cycling features that are useful and don't compromise its look off the bike. The length issue was only a minor one, it could be remedied by sizing up... or just manning up! There's nothing about the polo that explicitly says 'cycling'. £60 for a longish back that's not actually long enough and a couple of reflective tags. 8/10? Come on, have a word. A reflective logo the size of a 20p piece. Wow. Thanks Huez, now I'm safe on the roads. Surely tennis tail would be the appropriate style here to give lower back coverage? Tiny (& almost useless) reflective side-tabs (& puckered logo) look to be the only "cycling" detail here- if you want a branded wicking polo, they're a good deal cheaper - e.g. http://www.cotswoldoutdoor.com/helly-hansen-mens-kos-polo-18210305?id_co... = Helly Hansen for £40.